We simply pan fried the steak in a bit of olive oil and butter, after marinating it in steak seasoning and worcestershire sauce for about a half hour. The recipe for the romanesco is below. Break the romanesco into flowerettes and season with salt and pepper. Place in a glass pan, cover with foil and roast on 375 for about 30 minutes, until tender. In a small pan, melt the butter over low and add the pine nuts. 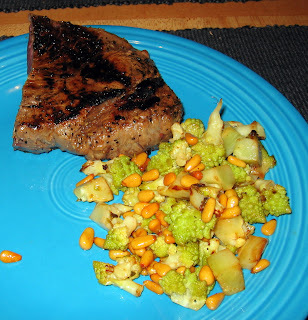 Cook until both butter and pine nuts are a golden brown. When romanesco is done roasting, toss in the brown butter and pine nuts. 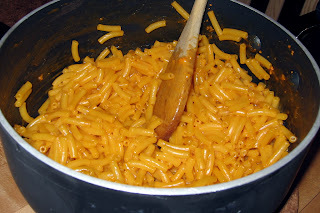 And, embarrassingly, we topped off this mean with some (delicious) Kraft Mac 'n Cheese. 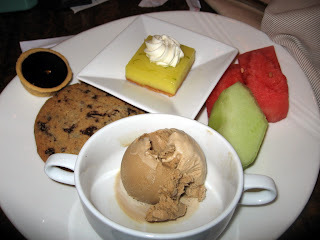 We were actually pretty pleased with the quality of the food at the 24 cafe in the Wynn. Also, the service was pleasant and the food arrived about 5 minutes after we ordered (we'd informed them that we needed to be out quickly since we had a flight to catch). 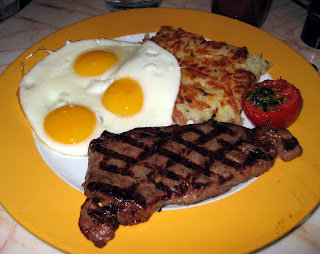 A better than average steak, perfect eggs but sub-par, gooey hash browns. 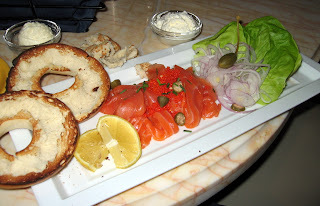 Kind of expensive for a bagel, but the lox portion was generous and the ingredients were fresh and tasty. Interestingly, caper berries were used instead of capers. 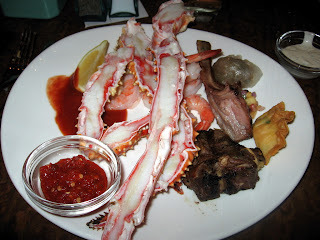 We went to an early dinner at The Buffet at the Wynn, which we heard was one of the best buffets in Vegas. 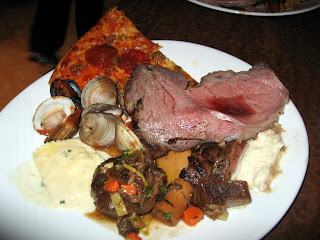 Also, all weekend they had a special Thanksgiving version of the buffet, which had a variety of meats and all the Thanksgiving classics. 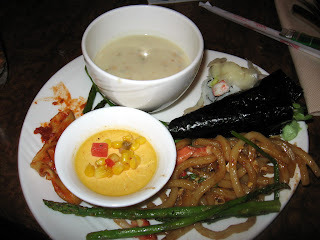 Overall the buffet was pretty good and we definitely ate too much. The price per person was $50. This was a surprisingly tasty dish. 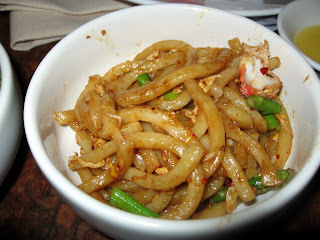 The noodles had a great chew that you usually don't see udon, which usually becomes very soft in soup. You really can't go wrong with endless crab dipped in chili sauce and drawn butter. Burger Bar in Las Vegas: Best Burger in the West? 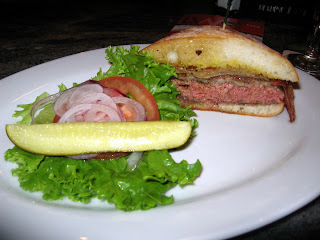 When we go to Vegas, we always make a point of going to Burger Bar, Hubert Keller's (of Fleur de Lys) burger joint. Burger Bar's schtick is that they have about 60 different a la carte burger toppings and 5 kinds of meat. This time we tried to make the most decadent burger we could and I think we succeeded. Although this was an expensive burger, it was totally worth it. It was decadent and delicious. What always surprises us is that the piece of foie gras is so generous. Alexis just got a job offer, so we went out to celebrate at Ducca, a place that's been on our list for a few months. It ended up being tastier than expected. 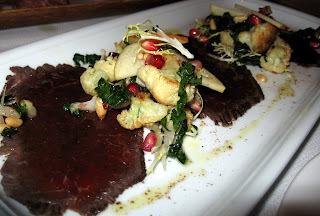 Although the venison was a bit thicker than one would expect for a carpaccio, the flavors were delicious. 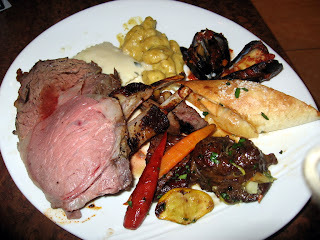 The pickled veggies were the stronger component of this dish; they were delicious. 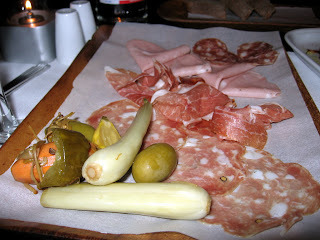 The salumi was nice, but not special. 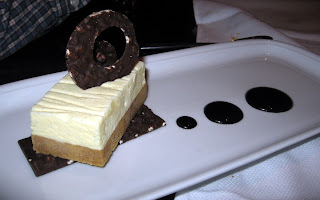 Although a little sweet, overall, this was a very tasty dish. 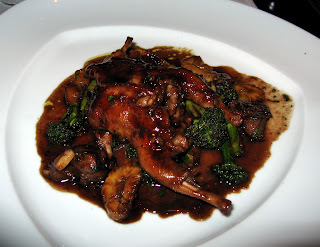 The quail was cooked perfectly and the slices of nutty chestnut added a nice contrast to the bright flavors of the sauce. 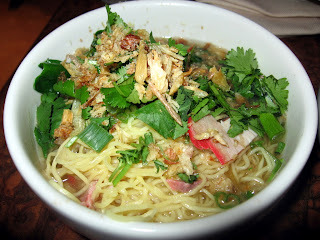 This was a very tasty dish, although the garbonzos didn't add much. 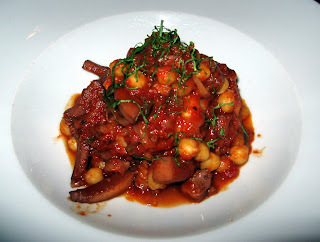 The halibut cheeks were firm, almost like a scallop and were quite wonderful in the rich, tomato-based sauce. This half portion was just right. 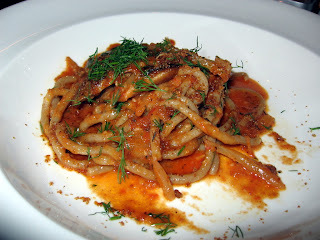 This dish was good, but was overpowered by the excessive fresh dill. This deconstructed and fresh take on an Italian classic was good, but not amazing. Too New for Health Code Violations? 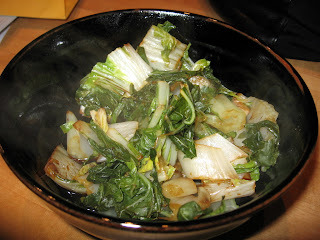 This is a simple dish of chopped, steamed bok choy that we seasoned simply with a quick ponzu of soy, Splenda and rice vinegar. This is a quick weeknight meal that freezes well for later use. Sautee the onions in the soy sauce until soft. Add the ground turkey and the rest of the sauces and cook until browned. 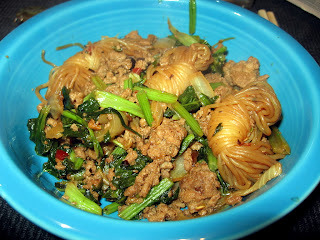 Add the noodles and stir to coat in the sauce. Add the turnip greens and cover. Simmer for a few minutes, until turnip greens are soft. Stir everything to coat. We had some Thanksgiving ingredients left over and since pork and apples go well together, and we had a pork loin in the freezer, this dish seemed like a good use of everything. Giao found it a bit too sweet, but he doesn't really like sweet with savory. We served it with a fresh green salad. Mix the wine, salt, pepper and mustard together and marinate the pork pieces for at least 1/2 and hour. Sautee the onion in a bit of olive oil. When becoming translucent, add the pork and sautee until cooked through. In another pan, sautee the diced apple in butter until brown and soft. 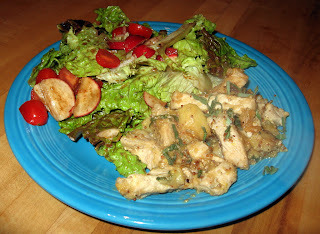 When pork is done, add the apple and sage and stir to combine. 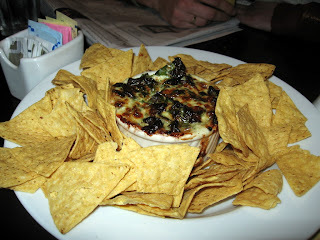 Usually we just eat wings at Jillian's but this time we went for the spinach dip and it was a good decision. It was creamy and bad for you, yet packed with spinach, making you feel just a bit better.